Every successful company has a focus. A central core that everyone understands as the force behind them. Here at QEM Solutions we are no different. And, reassuringly, our vision and values are the same today as they were when we started in 2003. We are at the heart of our clients success. They cannot imagine a project without us. They will automatically think of us at the heart of what makes them stand out to their clients. Always go above our clients expectations. Work harder than those around us, with more conviction and more enthusiasm. Treat staff, clients and sub-contractors with the respect required to gain their trust and commitment. Continually endeavour to be better than we were before. Try to ensure a safe working environment and where possible influence those around us to do the same. Continually try to reduce our impact on our surrounding environment, by realistically setting targets and goals. Maintain our integrity and impartiality at all times, no matter what the situation. Quality is at the heart of everything we do. It would be hypocritical for it not to be, considering we see ourselves as the best in the industry. 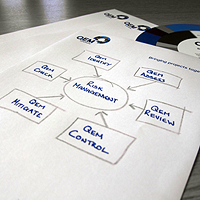 We operate a system that ensures that all risks associated with QEM, whether they are health, Safety, environmental or business, are assessed and mitigated.